A Middle Eastern talisman traditionally endowed with helpful, magical properties, the Hand of Fatima is used to avert the evil eye. 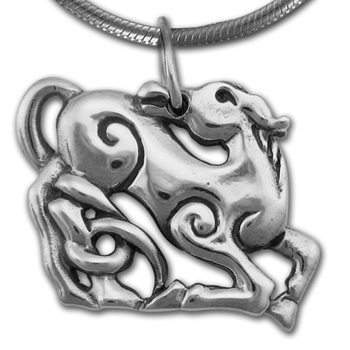 Intricately carved in wax, then cast in sterling silver using the lost-wax casting process, this protective amulet dates back thousands of years. 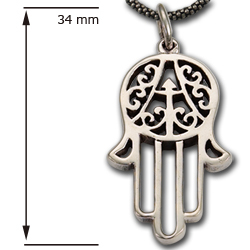 Also known as Hamsa, Chamsa, Chamseh or Khamsa. I ordered this pendant a couple of years ago and have been wearing it since. 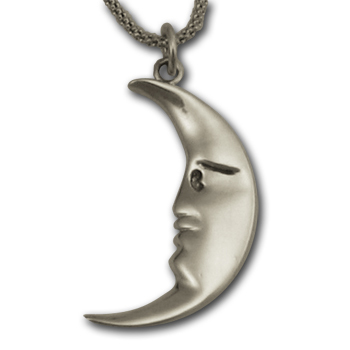 I wear it on a silver chain with a couple of other small pendants and get a lot of compliments on it. It has a beautiful design and a nice weight - its not 'cheesy' at all, but thick and cleanly carved. Having lived in the Middle East this reminds me of many similar designs I've seen on doors in Morocco. Absolutely loved this hamsah! One of the most beautiful ones I've ever seen. Thank you! Very pleased. This is such an interesting and unique piece I had to have it. I did not know what it meant,that it wards off the evil eye and all, but I've gotten so many compliments every time I've worn it! I love it! !